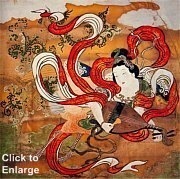 I’m delving into the paranormal life and times of Japanese Gods and Goddesses. Not delving, let’s just say putting my toes into the ocean. 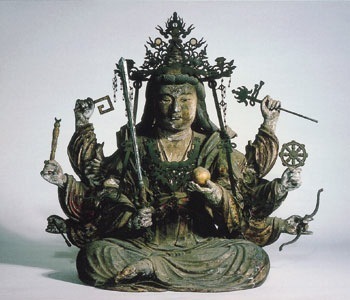 So the first one of these series of blogs, one of the main ones for my sequel to Pillow Book of the Flower Samurai, is Benzaiten, or Benten. She is amazing. As you can see, women tattoo their bodies with her image. She is the goddess of literature, music, wealth, and femininity. 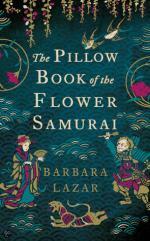 She plays the biwa, a Japanese lute. Oh yes, below she brandishes a sword, too. 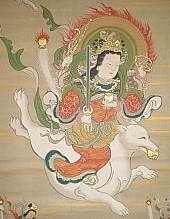 Associated with the Japanese Luck Gods (there are 7 of them), Benzaiten also connects with the sea. So much so, she is frequently portrayed riding or traveling with a sea dragon. According to some sources, there are 800 or more Gods and Goddesses, some sources say thousands, yes, thousands of Gods and Goddesses. That’s not the focus here. Here I’m doing one God or Goddess per blog. 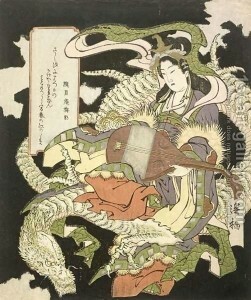 Today it’s Benzaiten. There is little She cannot do.